The Office of National Marine Sanctuaries (ONMS) serves as the trustee for a system of 14 marine protected areas, encompassing more than 150,000 square miles of ocean and Great Lakes waters from Washington state to the Florida Keys, and from Lake Huron to American Samoa. NOAA's National Ocean Service manages the national marine sanctuaries through the authority of the National Marine Sanctuaries Act of 1972, 16 U.S.C. § 1431 et seq. Marine sanctuaries contain deep ocean gardens, coral reefs, whale migration corridors, deep-sea canyons, historically significant shipwrecks, and other underwater archaeological sites. They range in size from one-quarter square mile in Fagatele Bay, American Samoa, to more than 134,000 square miles at the Papahanaumokuakea Marine National Monument, located in the northwest Hawaiian Archipelago. The ONMS fosters public awareness of marine resources and maritime heritage through scientific research, monitoring, exploration, education, and outreach and works closely with its many partners and the public to protect and manage sanctuaries. The ONMS is a world leader in marine management by protecting living marine creatures, environmental quality, and maritime heritage resources, while maintaining recreational and commercial activities that are sustainable and compatible with long-term preservation. Located in northwestern Lake Huron, Thunder Bay is adjacent to one of the most treacherous stretches of water within the Great Lakes system. Unpredictable weather, murky fog banks, sudden gales, and rocky shoals earned the area the name "Shipwreck Alley." Today, the 4300-square-mile Thunder Bay National Marine Sanctuary protects one of America's best-preserved and nationally-significant collections of shipwrecks. Fire, ice, collisions, and storms have claimed over 200 vessels in and around Thunder Bay. To date, nearly 100 shipwrecks have been discovered within the sanctuary. Although the sheer number of shipwrecks is impressive, it is the range of vessel types located in the sanctuary that makes the collection nationally significant. From an 1844 sidewheel steamer to a modern 500-foot-long German freighter, the shipwrecks of Thunder Bay represent a microcosm of maritime commerce and travel on the Great Lakes. Before Thunder Bay's designation as a national marine sanctuary in 2000, the state of Michigan created the Thunder Bay Underwater Preserve, a 290-square-mile area designated in 1981 as the first of eleven preserves authorized by Michigan's "Bottomlands Act", 1980 PA 184, MCL 299.51 et seq. The state's preserve program is presently authorized by Part 761 of the Natural Resources and Environmental Protection Act, 1994 PA 451, MCL 324.76101 et seq. The 448-square-mile area of Lake Huron is now both a national marine sanctuary and a state underwater preserve. 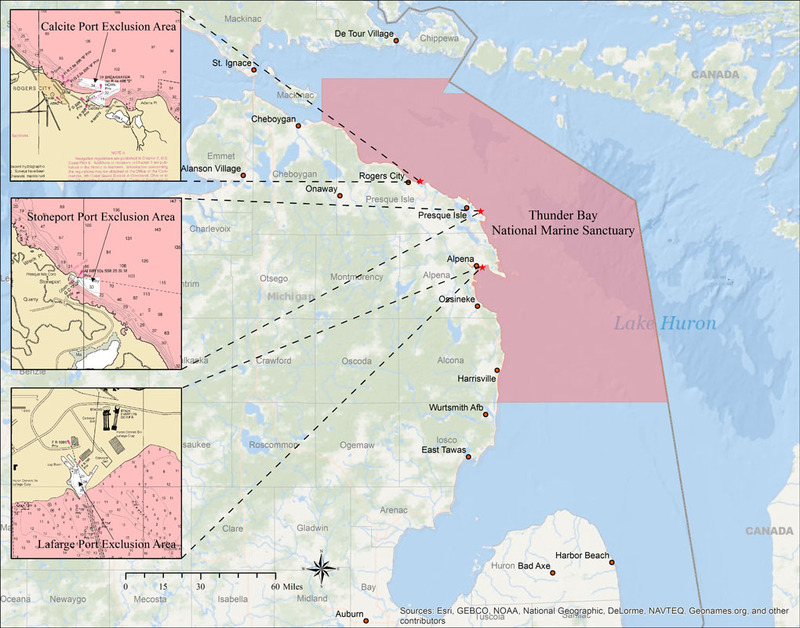 The Thunder Bay National Marine Sanctuary is jointly managed by NOAA and the state of Michigan. The sanctuary superintendent manages the day-to-day operations and activities of the site. A Joint Management Committee, consisting of the director of the ONMS and a state agency member, makes major policy, budget, and management decisions. In addition, an advisory council provides advice to the sanctuary superintendent. Members of the advisory council represent the community's interests, including government, education, maritime history and interpretation, fishing, diving, tourism, economic development, the state-designated underwater preserve, and the community-at-large. The advisory council members serve as liaisons between their constituents and the sanctuary, keeping sanctuary staff informed of issues and concerns. The official name of the sanctuary is the Thunder Bay National Marine Sanctuary and Underwater Preserve. To simplify the name, the Joint Management Committee has agreed to use Thunder Bay National Marine Sanctuary. For over 12,000 years, people have traveled on the Great Lakes. From Native American dugout canoes to wooden sailing craft and steel freighters, thousands of ships have made millions of voyages across the Great Lakes. The last 150 years have been particularly explosive, transforming the region into one of the world's busiest waterways. Yet, with extraordinary growth comes adversity. Over 200 pioneer steamboats, majesticschooners, and huge steel freighters wrecked near Thunder Bay alone. Today, the sanctuary's shipwrecks capture dramatic moments from centuries that transformed America. As a collection, they illuminate an era of enormous growth and remind us of risks taken and tragedies endured. Lake Huron's cold, fresh water ensures that Thunder Bay's shipwrecks are among the best preserved in the world. Many sites remain virtually unchanged for over 150 years. With masts still standing, deck hardware in place, and the crews' personal possessions often surviving, sites located in deeper waters are true time capsules. Other shipwrecks lay well-preserved but broken up in shallower waters. Readily accessible by kayakers, snorkelers, and divers of all abilities, these sites often provide sanctuary users with their first shipwreck experience. The Thunder Bay National Marine Sanctuary regulations protect these maritime heritage resources. To enforce these regulations, the sanctuary partners with local, state, and federal authorities. It also relies on observations from recreational divers and other members of the community. The sanctuary strongly encourages recreational divers, snorkelers, and kayakers to responsibly visit sanctuary shipwrecks. To facilitate recreational access, the sanctuary invests in mooring buoys designed to improve safety and access to resources, while reducing visitor impacts. Ice, waves, and aquatic invasive species such as zebra and quagga mussels could potentially harm maritime heritage resources. The sanctuary is working with university and NOAA scientists to develop long term monitoring programs to better understand how the chemical, biological, and physical conditions found around Thunder Bay's shipwrecks are affecting the corrosion and deterioration of these irreplaceable archaeological sites. The sanctuary's education and outreach programs help people of all ages and backgrounds enrich their lives while learning about, physically experiencing, and working to preserve the Great Lakes and their maritime heritage. Because people preserve what they value, and value what they understand, Thunder Bay National Marine Sanctuary embraces education as a powerful resource preservation tool. Sanctuary education comes in many forms, from programs for teachers and students to imaginative exhibits, and from community boat building to remotely operated vehicle competitions. Although preservation is the central message, the sanctuary promotes learning across the curriculum. scientific research and monitoring of its maritime heritage resources to ensure their long-term protection. Archaeological and historical research conducted by the sanctuary and its partners is fundamental to better understanding the region's historic shipwrecks. This knowledge is essential for addressing management issues and enhancing resource protection. Archaeological and historical research is also at the heart of the sanctuary's exhibits, education initiatives, and public programming. The sanctuary relies heavily on the work of others to help carry out its mission. Partners in the form of private businesses, non-governmental organizations, educational and cultural institutions, and local, state, and federal agencies provide expertise for scientific research and exploration, resources and capacities for site monitoring and enforcement, and support for education and outreach programs. Thunder Bay National Marine Sanctuary's many partnerships have been, and will continue to be, critical to the success of the sanctuary.